Definition at line 65 of file brush.h. Definition at line 67 of file brush.h. Referenced by EBRUSHOBJ_bRealizeBrush(), EBRUSHOBJ_iSetSolidColor(), EBRUSHOBJ_vCleanup(), EBRUSHOBJ_vInit(), EBRUSHOBJ_vSetSolidRGBColor(), IntGdiFillRgn(), IntPatBlt(), and UserDrawIconEx(). Definition at line 75 of file brush.h. Referenced by EBRUSHOBJ_bRealizeBrush(), EBRUSHOBJ_vInit(), and EBRUSHOBJ_vSetSolidRGBColor(). Definition at line 74 of file brush.h. Referenced by EBRUSHOBJ_bRealizeBrush(), and EBRUSHOBJ_vInit(). Definition at line 69 of file brush.h. Definition at line 85 of file brush.h. Referenced by EBRUSHOBJ_psoMask(), EBRUSHOBJ_vInit(), and EBRUSHOBJ_vSetSolidRGBColor(). Definition at line 84 of file brush.h. Referenced by EBRUSHOBJ_bRealizeBrush(), EBRUSHOBJ_psoMask(), EBRUSHOBJ_vInit(), EngLineTo(), HandleStyles(), IntEngLineTo(), IntPatBlt(), NEtoSW(), NWtoSE(), SEtoNW(), and SWtoNE(). Definition at line 76 of file brush.h. Definition at line 71 of file brush.h. Referenced by EBRUSHOBJ_pvGetEngBrush(), EBRUSHOBJ_vCleanup(), EBRUSHOBJ_vInit(), and EngRealizeBrush(). Definition at line 81 of file brush.h. Referenced by EBRUSHOBJ_bRealizeBrush(), EBRUSHOBJ_vCleanup(), and EBRUSHOBJ_vInit(). Definition at line 82 of file brush.h. Definition at line 80 of file brush.h. Referenced by EBRUSHOBJ_vCleanup(), EBRUSHOBJ_vInit(), and EBRUSHOBJ_vSetSolidRGBColor(). Definition at line 90 of file brush.h. 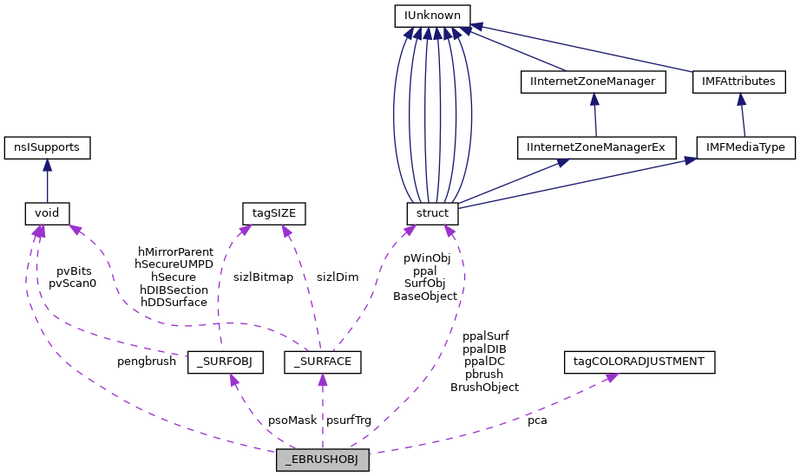 Referenced by EBRUSHOBJ_psoMask(), EBRUSHOBJ_vCleanup(), and EBRUSHOBJ_vInit(). Definition at line 79 of file brush.h. Referenced by EBRUSHOBJ_bRealizeBrush(), EBRUSHOBJ_psoMask(), and EBRUSHOBJ_vInit(). Definition at line 73 of file brush.h. Definition at line 70 of file brush.h. Referenced by BRUSHOBJ_ulGetBrushColor(), and EBRUSHOBJ_vSetSolidRGBColor(). Definition at line 72 of file brush.h. Definition at line 86 of file brush.h.